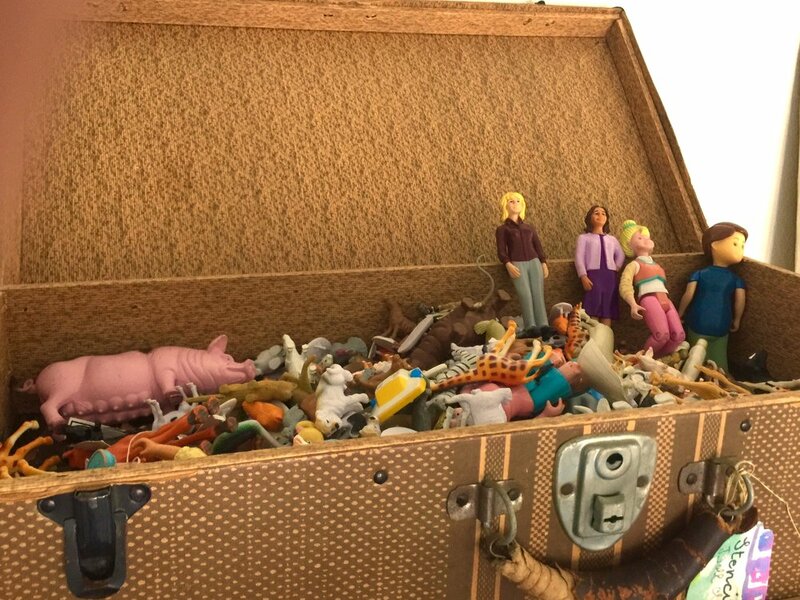 that I have one of the largest collections of miniature plastic animals and people in Northern San Diego? You may want to know how I acquired this menagerie? I discovered bins filled with these plastic creature at a low budget party shop over 20 years ago. I used most of these critters as models for my watercolor children’s book illustrations. I also have an extra large number of pink plastic pigs that I use to teach drawing fundamentals. This morning I climbed up to the top of my step ladder to get the pigs out of their suitcase to take them to San Clemente Art Supply where I will be teaching a workshop this weekend. I had forgotten how glorious my plastic animal (I have a few multi cultural plastic families too) collection is. Inspiration struck me, and I chose several paintable animals from my collection and arranged them on my shelf to see their artistic possibilities. I think as soon as I am finished with my English countryside painting series of cottages, cups and teapots: my England period, I am going to begin my plastic animal painting period.